True West Theatre and Riverside productions present RU4ME written and performed by Annie Byron. based on KISSING FROGS by Andee Jones in the Lennox Theatre, Riverside theatres, Parramatta. 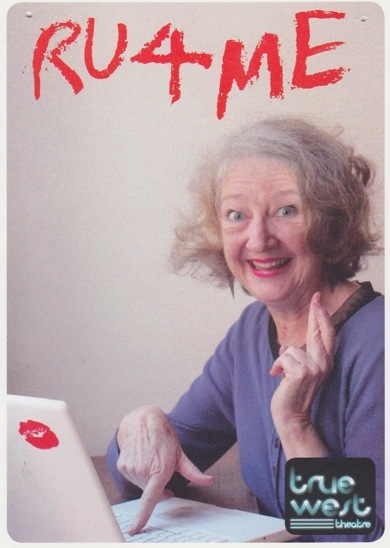 RU4ME is a delightful evening in the theatre with a winsomely seductive Connie (Annie Byron) who relates to us her 'adventures' in the sphere of 'internet dating". This senior lady, seeking a 'partner' to attend 'art house movies' and, perhaps, other things, under the guidance of her daughter, Rosie, begins a series of ventures that are amusing and cautionary. Ms Byron has adapted a book by Andee Jones, KISSING FROGS, and with the directorial assistance of Wayne Harrison, developed a 75 minute performance. The writing is swiftly to-the-point and full of entertaining anecdotes, acted out on a simple set of chairs, desk and lots of props - especially scarfs, from a deep, deep handbag - sitting on a raised platform, and backed by a video screen that introduces us to the images of some of the men on the 'trawl' (Set Design, Andrea Espinoza; Video and Lighting Design, Nicholas Higgins; Sound Design, Jeremy "Jed" Silver.) Ms Byron in her usual winning style: charming, vulnerable and welcoming, creates Connie as an adventuresome everywoman - someone we would like to know, someone we can trust as a guide to the 'perils' and 'pleasantries' of this very contemporary internet opportunity, and, maybe, even go to the art house movies with. I had a very easy time, and the audience about me had a very good time, as well. RU4ME is a theatre delight written by Ms Byron for Ms Byron to play. This charming work is touring around the states and country over the next month and I can quite genuinely recommend it as a pleasantly, gently rewarding time.